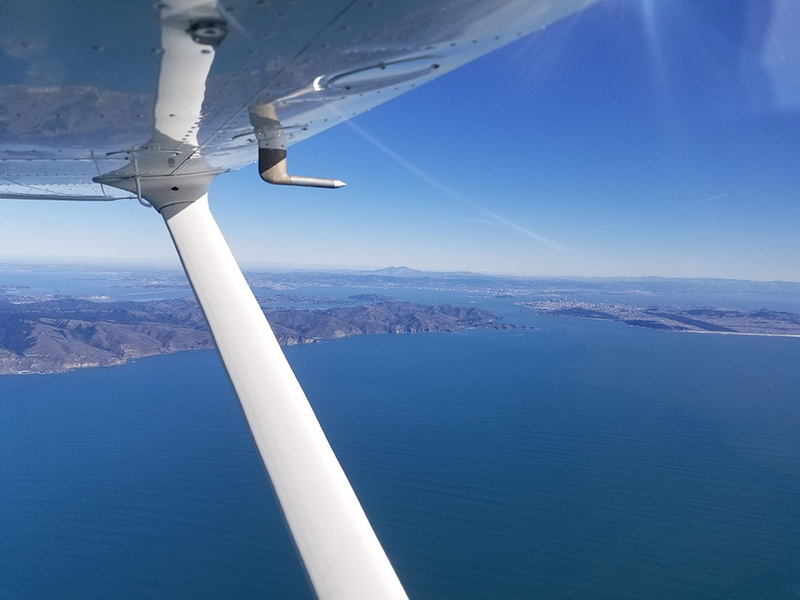 We would take off from Palo Alto and fly either to Crescent City (KCEC) or if the coastal weather wasn't good we would fly up the central valley to Redding (KRDD), stop for lunch and fuel and continue on. We started on a path towards Fortuna at 6,500feet and were going to fly up the coast to Crescent City, but as we got closer, the cloud layer was lowering and getting thicker. I had to make a decision, do I head out to the coast and try and get under it, or do I head inland where it was still clear. I opted to go inland and head over to Redding. We climb up to 9,500 to put some distance between us and the mountain range and head over to RDD. We got a straight-in approach to RDD to runway 30. From far away it was slightly difficult to tell what was the airport as it blended in with the surroundings, but we found it and got straight in. 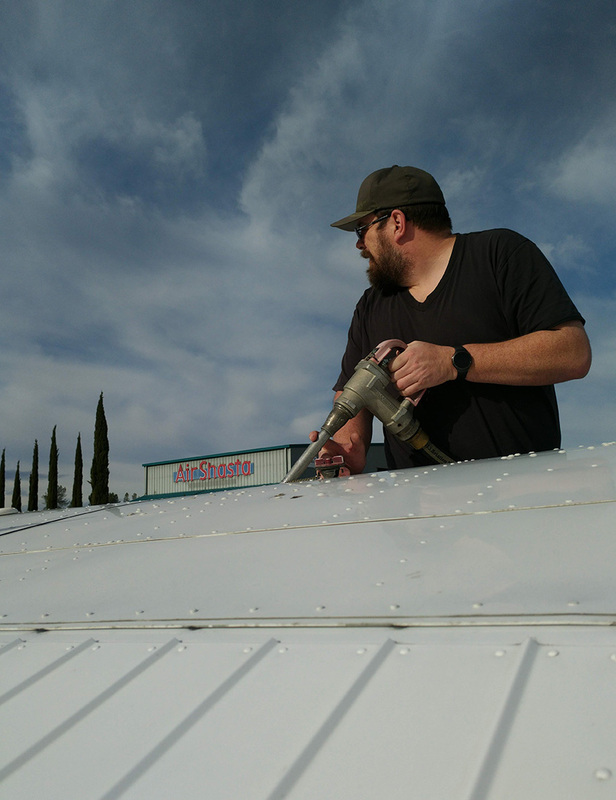 Once on the ground, we taxied over to the self-serve fuel pump and filled up the plane. Then put it into a parking spot. From there we went into the main terminal building and had lunch at Peter Chu's Skyroom. 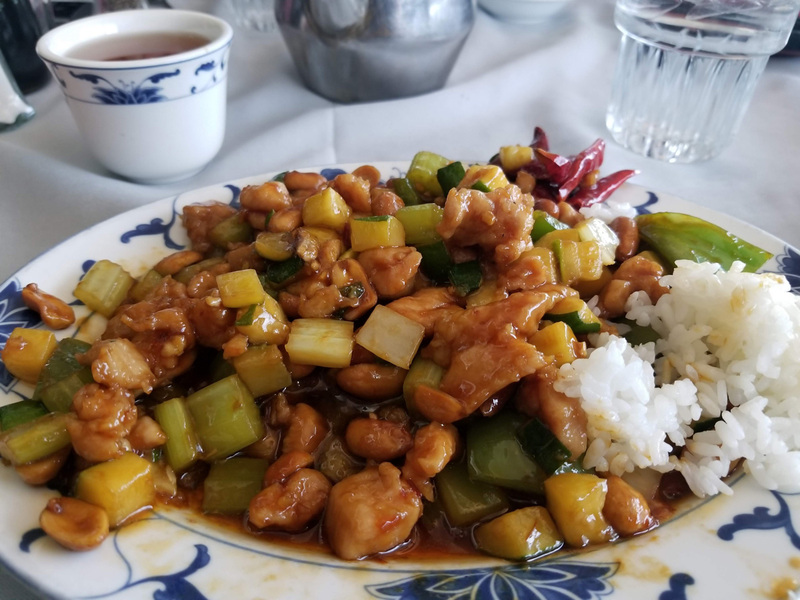 This was the very best Kung Pao Chicken I've had in a very long time. The service was great and the meal included fried wantons, soup, and rice. After lunch, we hopped back in the plane and started north. We got to about Weed California before the fog and clouds began descending and the terrain rising. Earlier we heard on the radio that it was clear above the cloud layer, but we were below it, we could land at Weed and wait out the weather or we can head back and try and get above it. 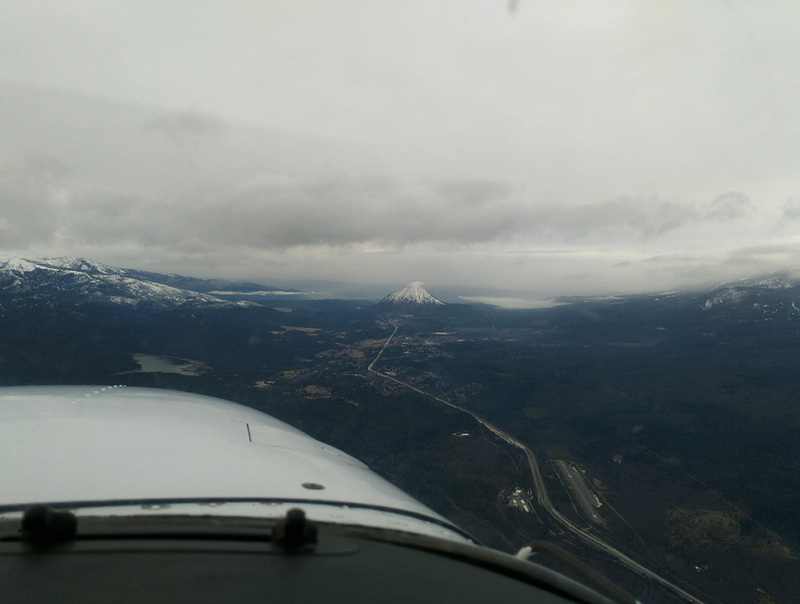 We decided to turn around and head back towards Redding since Weed Airport was at a higher elevation than I was supposed to land at with a club plane and I wasn't sure what the weather would be like in the morning and didn't want to get stuck there. As we got close I was thinking we could climb above the clouds and continue North, but it was about 4:30pm so we decided to just land, have some dinner and beer and call it a night. The next morning, the weather was amazing. We got up, headed down to the restaurant at the hotel and had breakfast, then took the shuttle back to the airport. After performing the pre-flight, we got a straight out departure to the north. As we got back around Mt. 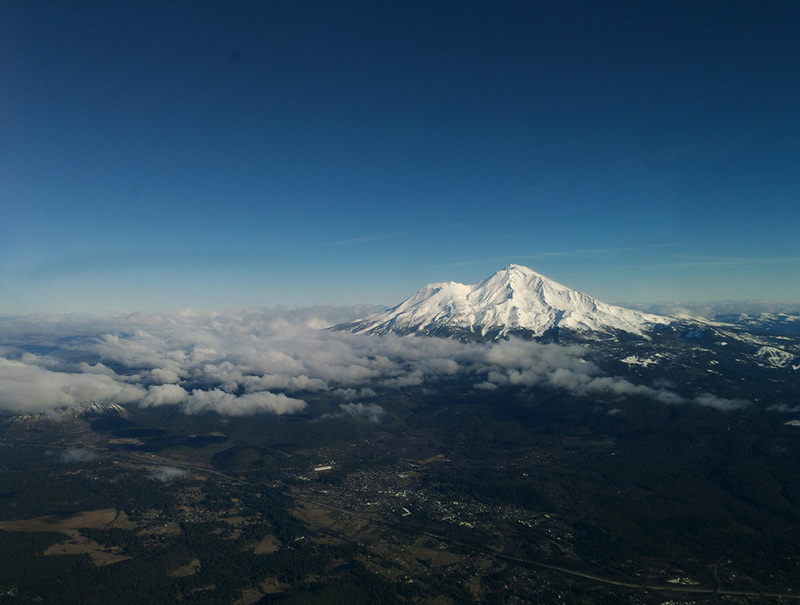 Shasta, we noticed some clouds and mountain obscuration in front of us, so we continued to climb to 12,500 feet. We hung out up there for about 30 minutes to stay above the mountains and clouds and not be affected by mountain turbulence. It was very smooth up there, but since we didn't have supplemental oxygen, we decided to continue the flight at 10,500. This was much more comfortable, the air was still smooth, and we were making better time as there was less headwind, about 10 knots faster over the ground. 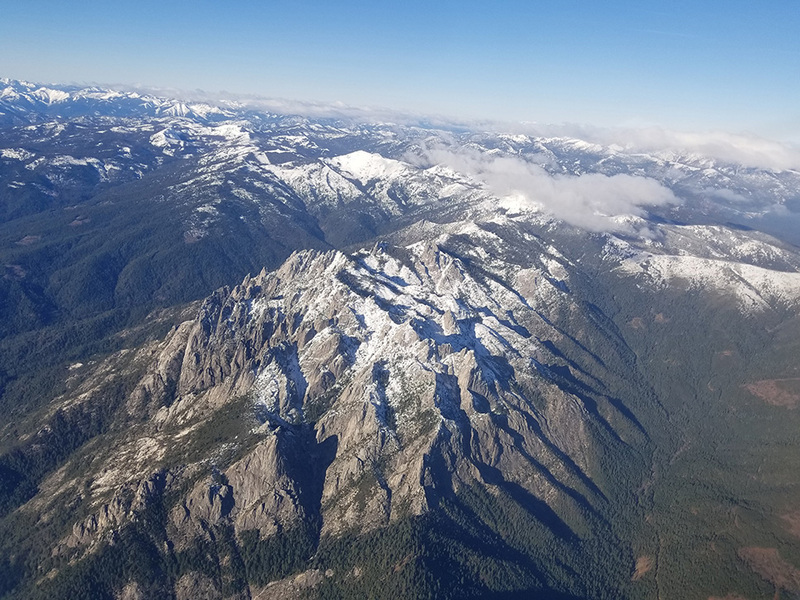 Once we got over Corvallas Oregon, Cascade Approach asked us to get the ATIS and begin our descent into Aurora. The ATIS stated they were using RNAV 35 approach, so we asked if we could get in there visually. The controller wasn't sure as it was the airport was the next sectors responsibility. Once we were handed over, the next controller wasn't sure either but asked us to continue. We descended to about 3,000 feet and had to dodge some clouds. Once we got down to about 1,600 feet, we were below all the clouds, could see the airport and got a straight in landing. We parked at the FBO requested they fill the plane with full fuel, met my dad. We noticed that Vans Aircraft was on the field, and I've been wanting to actually sit in one for nearly a decade. So we got a factory tour and was able to sit in the RV-10 and RV-14. 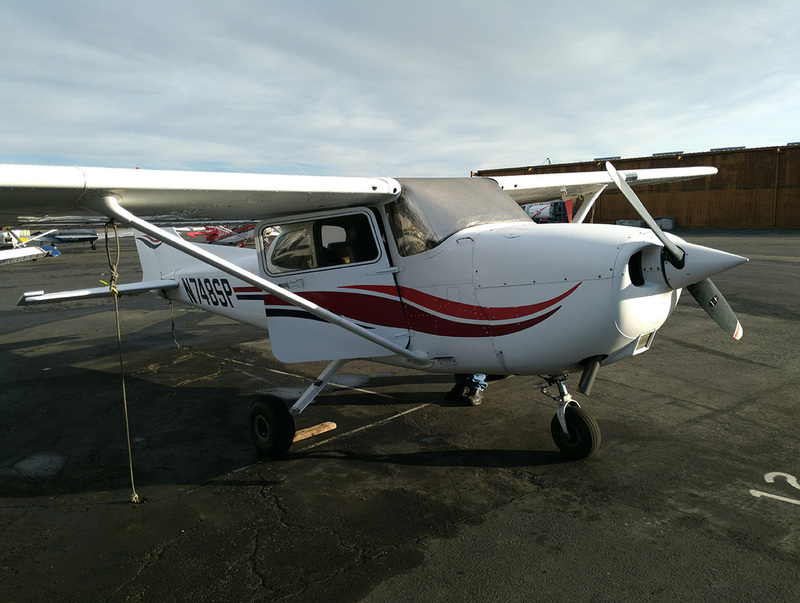 I've decided, when its time to start building one, it's going to have to be the bigger of the two since I'm such a big person, but the plane was comfortable. After that, we headed to my folk's house where my grandpa was. We had some dinner and great conversations. The next morning, I was looking at the weather forecast for the next few days, we were thinking about flying up towards Seattle to visit Patrick's sister, but the weather was "socked in", but more than that, ceilings were at 3,000 feet over Portland area and getting lower. As I examined the forecasts in detail, it looked like the weather was going to get pretty bad for VFR flight and would remain for the next 4 days. If we didn't get out of there before 1pm, we were going to be stuck there. The weather was north of us, and if we headed south, by the time we got to Eugene we would be out from under the clouds and could get above them. We decided to head home. 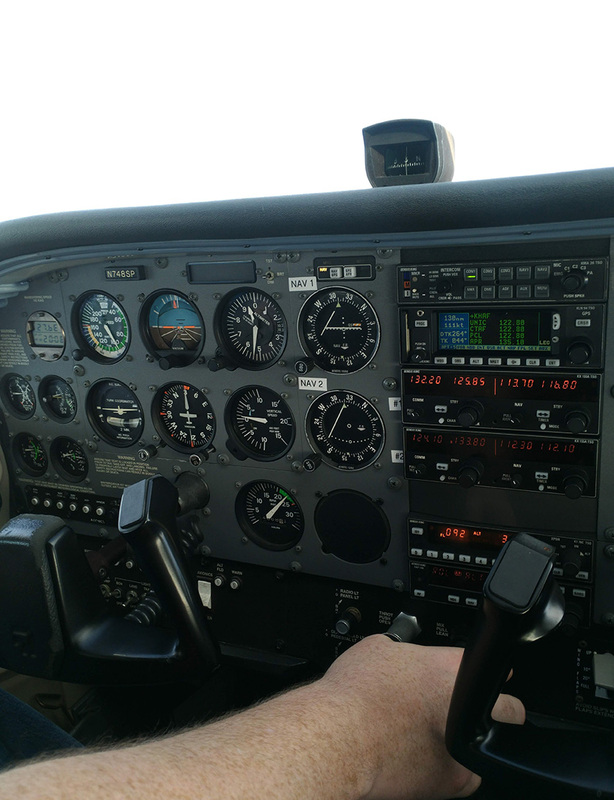 Headed to Aurora airport, did our pre-flight checks and took off on runway 35 with a downwind departure to the southwest. We had to hang out about 2,500 feet for an hour, and just as predicted at Eugene, the clouds above us ended and we were able to climb. It took us 27 minutes to climb from 3,000 to 11,500 but once we got up there, we were making great time. At one point, we saw 160 knots over the ground. It took us three and a half hours to get to the Golden Gate area. We got a Class Bravo clearance and cut across the departure end at 5,500 a few miles out to sea. Overall, the return trip took just 4 hours, the total hobbs time on the plane was 12.8 hours. It was a great three days of flying and spending time with my good friend Patrick. Next time, I hope to have more time to spend at the destination exploring the area from the air.